Following the death of a distinguished old boy of The Armidale School, Rex Budd DFC, in November last year, I was asked to write a tribute to him for the February edition of the Old Boys’ Magazine. This is reproduced below. Copyright in the image belongs to the Australian War Memorial. Flight Lieutenant Rex Robert Budd DFC died on 4 November 2010 after a short battle with cancer. Rex was born in Murwillumbah on 5 September 1935. He grew up in Murwillumbah, and attended The Armidale School from 1950-52. He participated very actively in the life of the school, being a member of the Dramatic Society for the three years of his attendance, a member of the Swimming Team, the Choir, and the Library Committee, a Sergeant in the Cadet Corps, and a Monitor in his final year. He received a Merit Award, and matriculated with Honours in Maths. After leaving school he spent time at Nerrigundah station outside Quilpie, roo shooting and filling in time until he was old enough to join the Air Force. After joining the Queensland University Squadron at Archerfield to undergo his National Service training, he was accepted into RAAF pilot training. 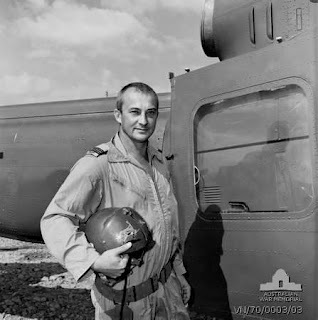 He graduated top of his flying course and served in flying roles with two Air Trials Units (Meteor), two Fighter Operational Conversion Units; 3, 76, 79 Fighter Squadrons (Vampire and Sabre); 5 and 9 Squadrons (Iroquois and Bushranger gunships)and in administrative appointments with other units. He served two operational tours of duty with 9 Squadron between 1968 and 1970 flying Iroquois helicopters during the Vietnam War. He was the first RAAF pilot to log 1000 hours during that campaign and was the third of five gunship flight commanders, all having previously flown fighter aircraft. He was awarded the Distinguished Flying Cross for his superior leadership, courage and devotion to duty during 625 days service overall in Vietnam. During that service he showed both his daring and his innovation. On one occasion he rescued six SAS soldiers who were under enemy fire, lifting the patrol out of the jungle on 45 metre ropes, needless to say coming under fire himself in the process. He was the third of the five “Bushranger” gunship flight commanders to serve with 9 Squadron. This gunship variant of the Iroquois helicopter, was a simple yet very effective air weapons system, created through typical Aussie ingenuity. Legend has it that the prototype aircraft was constructed from weaponry and other components bartered from the Americans for slouch hats and Australian beer. The whole Squadron contributed to the development of the project in some way and it was a fine team effort. After returning home from Vietnam he started his own helicopter mustering business based in Mareeba and became one of the pioneers of helicopter mustering. On so doing he recognised the skills needed from people who had worked in the bush and who understood stock – he felt that it was easier to teach a stockman to fly a helicopter than to teach a helicopter pilot how to be a stockman. As he worked his way around the various properties Rex kept a weather eye out for good stockmen who were interested in becoming pilots. He was a man of generous spirit. In 1972, in the early days of helicopter mustering, he went to Highbury Station where Kerry Slingsby was head stockman. Kerry Slingsby had started his working life at age 14 as a ringer in outback Queensland and by the time he was 24 he was head stockman at Highbury. Highbury had invested in its own helicopter and pilot, but the pilot had little livestock experience. Rex took suggested that Kerry that he learn to fly the helicopter himself, took him for his first ever helicopter ride, the whole matter was settled over a bottle of rum, and Rex handed Kerry a cheque for $1000 to help pay for him to have the necessary flying training at Long Beach in the US. Rex didn’t leave Kerry to sink or swim. After Kerry had been in the US for a while he received a telegram from Rex saying, “By now you will think a helicopter is totally impossible to fly but stick at it and it will come to you”. When Kerry returned to Australia Rex gave him a mustering endorsement. Some time later Kerry went to Kununurra in the Kimberley and started his own mustering business, branched out into charter and tourism, and by the time he sold the business two years ago he owned 25 helicopters and 25 fixed wing aircraft. Kerry Slingsby was just one of several people who launched themselves into successful helicopter mustering businesses after coming into contact with Rex. In his spare time Rex enjoyed motor bikes, cars and gardening, for which he had a particular talent. He is credited with the importation into Australia of the Hughes/Schweitzer H269 piston engined helicopter and its application to mustering cattle. Rex is survived by his older brother Arthur.